Paddy Andrews will be out for at least six weeks after sustaining a broken jaw as a result of goalkeeper Niall Morgan's challenge in Tyrone's victory over Dublin on Saturday. Morgan's heavy challenge can't be revisited by the GAA's Central Competition Controls Committee because referee Jerome Henry had already dealt with the incident, showing Morgan a yellow card. But he can count himself very fortunate to have avoided dismissal given the weight of the challenge as his shoulder caught the Dublin forward's face after he sprinted to tackle him in the corner where the Hogan Stand and Nally Stand meet. The St Brigid's man - who will now miss their Dublin championship matches next month - is understood to have had corrective surgery. 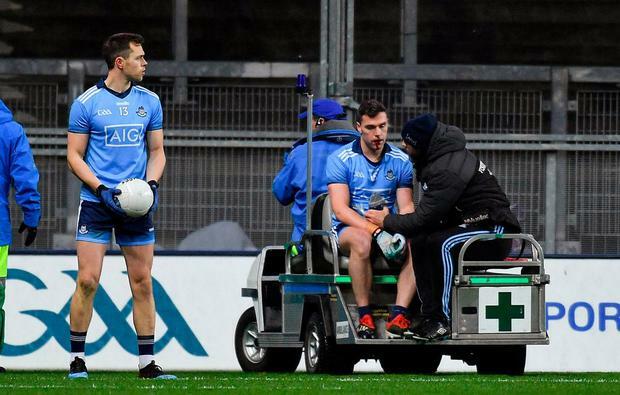 John Small and Cormac Costello also limped out of the action with suspected hamstring and ankle injuries that will rule them out of Dublin's remaining game against Cavan next weekend at least.